Horoscope of Mark David Chapman - Importance of Moon in Chart. Today's Celebrity Horoscope is of a person who himself was not a celebrity but ended up in killer of a celebrity. For those who don't know, Mark David Chapman was the person who shot John Lennon of Beatles Group in Dec, 1980. You can read more info about him here - https://en.wikipedia.org/wiki/Mark_David_Chapman. Dasha and Transits at the time of Shooting. Importance of Exalted Planets - Normally, we associate lots of importance to exalted planets in someone's chart. If someone is born with even 1 exalted planets, we tend to over-react that his life is going to be bed of roses and that 1 planet will save him from all the miseries of life. Having Sun or Jupiter exalted is seen as biggest blessings for person and it is read as if person will easily sail through a great life without any hurdles. Though I agree that it is good to have exalted planets in your chart and their dashas can be fruitful but it doesn't take away the importance of other planets which may be in not-so good dignity. Astrology is all inclusive, Everything is in addition. Importance of Moon - I have always felt and wrote that Moon is "The Most Important" planet in our chart because Moon represents our mind. If my mind is balanced and working fine then I will come out of any mess of my life but if my mind is not balanced then I may spoil whatever I have with me. Moon and Mercury are the planets we use 24x7. We can't go through our day without using mind and intellect/speech. So, their positions are very important. Again, it doesn't mean that other 7 planets are not important. We need to take every factor in consideration. Mark's Chart - Now, we come to the chart of person we are dealing with. He was born on May 10th, 1955. 19.30 PM at Fort Worth, Texas, USA. As we can see that he is Scorpio Ascendant with Ascendant Lord Mars is in 7th house in Taurus with 8th house lord Mercury. So, not only his ascendant is infamous one :) but lord is in neutral sign and it is conjunct its enemy Mercury which is 8th house lord. Scorpio and 8th house represent same things like Death & Rebirth Scenario and can be real chaotic at times. But what is startling is that he was born with 4 exalted planets, i.e. Sun in Aries, Jupiter in Cancer, Saturn in Libra and Venus in Pisces. So, how come person with such dignified planetary placements became a Psycho Killer? They say to have a good decent life, you should have at least your ascendant lord and Moon well placed. We have seen that his ascendant lord Mars is in neutral sign with enemy Mercury, which is 8th house lord. Now, let's see his Moon. 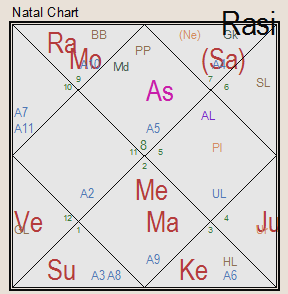 Moon is at the axis of Rahu/Ketu, within 6 degrees. Prima-facie, on this point itself, Moon is severely inflicted as Moon is most gentle planet and gets most easily impacted by other planets. Being at the axis of Rahu/Ketu within 6 degrees is serious affliction to Moon. Also, Moon is in Ketu's nakshatra Moola. Then Saturn's 3rd house aspect is on Moon from 12th house. An additional malefic impact on Moon. Then Mars' 8th house aspect is on Moon from 7th house. Out of all aspects of Mars, 8th aspect can be seriously damaging as it has the energy of 8th house of death & re-birth with it, specially if the planet impact is as feeble as Moon. So, Moon is impacted by almost all natural and functional malefic planets. This shows that this person's mind was completely under severe stress and he was unable to think properly. Last but not the least, all these malefic planets are also impacting Sagittarius sign. Sagittarius is normally sign of higher learning and religion but when it is impacted by malefic planets, like Rahu, Saturn and Mars here, it becomes sign of religious fundamentalism. It shows that he has a mind which had a religious fundamentalist approach and believe it or not, one of the reasons behind shooting John Lennon was that John said somewhere that "Beatles are more popular than Jesus". It could have been said in a humorous way without any intentional insult against Jesus (because let's face it, you can't insult someone who has realized God. He is out of this circle of insult and respect. ), but it didn't go too well with this fundamentalist mind. Dasha and Transits at the time of Shooting - These were his dashas & transits on day of shooting, i.e. 8th Dec, 1980. Mark was under Sun-Mercury-Saturn dasha at that time. MD planet Sun although was exalted in Aries but its lord Mars was in maraka house (7th house) with enemy Mercury (AD planet) which is 8th house lord. Saturn was in 12th house of Losses and Jails. Saturn is long duration and he is still in Jail. Transit-wise on 8th Dec-1980, dasha planets Sun-Mercury were in Scorpio, a huge indication of something going horribly wrong. Rahu was over his exalted Jupiter in 9th house. So, Wisdom of Jupiter got covered by Illusion of Rahu. Saturn-Jupiter were together in Virgo, a sign of conflicts but again, most startling fact was that he was born with Moon in Sagittarius at 11 degree and that day/time, Moon was in Sagittarius at 11 degree. Moon was conjunct same Mars which had 8th aspect in birth chart. So, things were not looking too good for the day but Moon's degree is what amazed me most. Conclusion - Moral behind this article is that don't stress-out if you don't have exalted planets in your chart. You can still do good in life. Also, don't stress-out if you have Moon afflicted by malefics like this guy had. 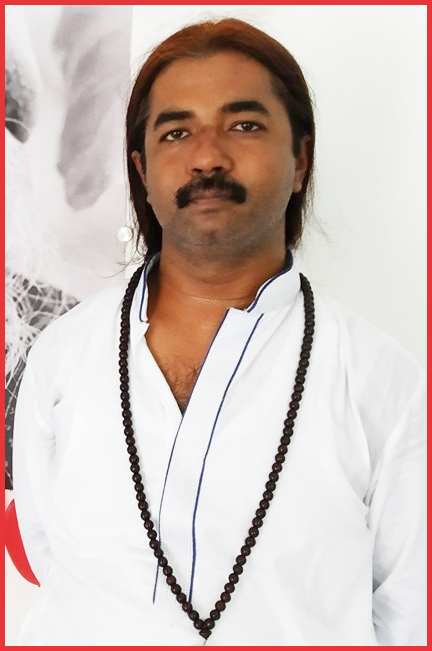 Universe was still giving him indication by giving him Moon in Sagittarius and Moola Nakshatra. He should have spent his time in research of higher learning, religious and spiritual things, meditation. That would have served him and his Moon well. I am sure that he is doing all this from last 37 years in jail. So, if you have afflicted Moon, just do regular meditation and you will find yourself with a balanced mind and approach. Things are manageable if we are receptive to omens, counselling and be aware of situations. Hope this helps. Please leave your comments/queries, if any.